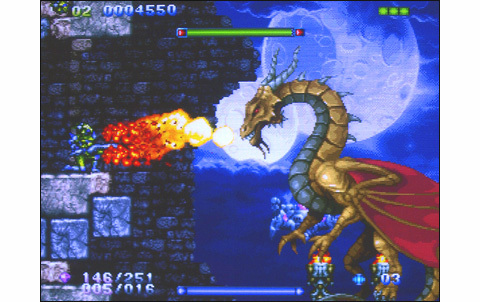 Some games have been long-desired on the Neo Geo, seen through pages of a Edge Magazine or a GamePro, but few can claim to have had players drooling for nearly two years. 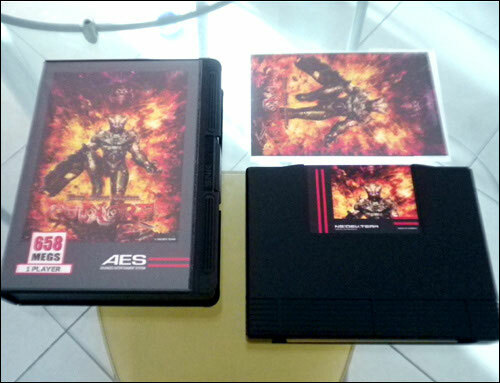 AES Gunlord version came in July 2013, after many rebounds and scandals... With this NG.Dev.Team production, we are dealing with a remake of Turrican, à la sauce Neo Geo. 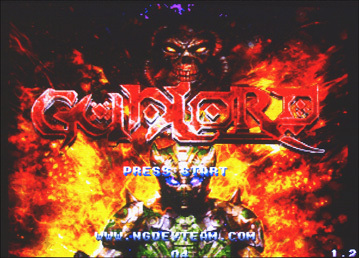 It's a game of platform that takes place in a futuristic universe, in which player controls a hero wearing a combat armor, Gorden Gaiden. 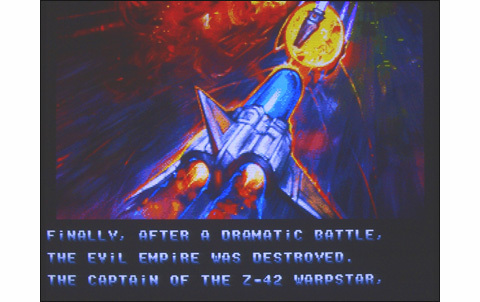 The scenario meets Last Hope's one: Vanessa Gaiden, the hero's wife who defeated the evil empire flying her Warpstar Z-42, was reported missing in action on her way back home... Gorden goes in search of her on the planet Kairos II. After a well-crafted 'Comic' introduction, we quickly get into the action. 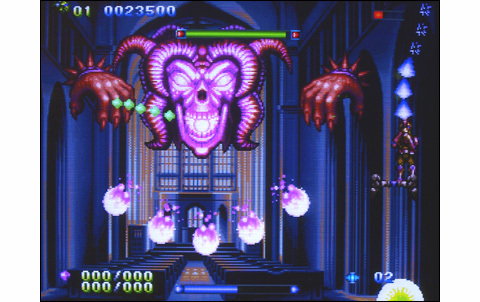 And let's be clear: in Gunlord, pixel-art is in the spotlight! The color palette is richly used and the amount of details sometimes... impressive. But who cares! 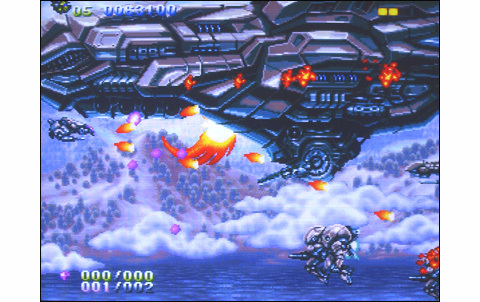 The title of NG.Dev.Team is not ridiculous at all compared to the other platform games on Neo Geo, and this is already not bad at all. 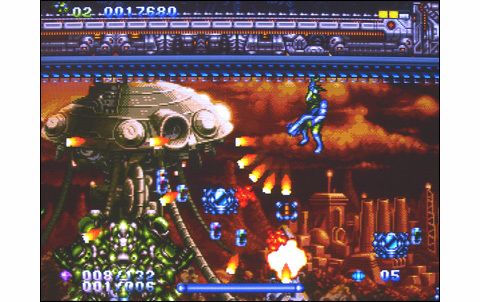 For the game itself, four buttons are used: shooting, jumping, plasma ray, side-flash. There are five different weapons, some of which are more powerful than others. 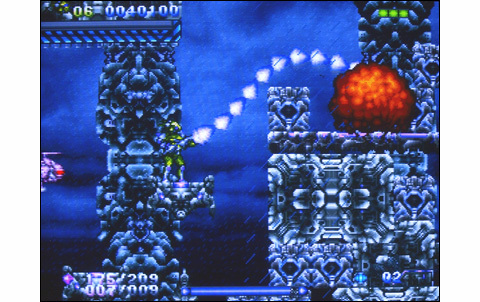 The plasma beam controlled with C is the ultimate weapon: it can be shot 360° around and get through walls... but its use is limited in time. 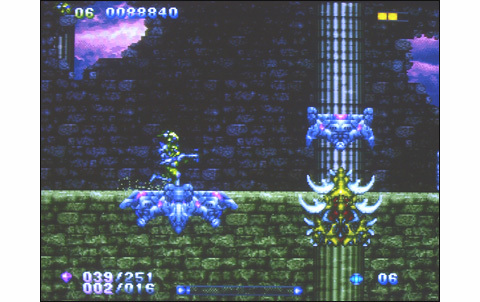 The side-flash , available in limited quantities, scans the entire screen, but is not very powerful. By holding down+B, our hero can roll, Which allows access to steep places. The controls are intuitive and comprehensive, with eight-direction for the shots, two amplitudes for jumping, but also the ability to hold onto some walls or roofs. 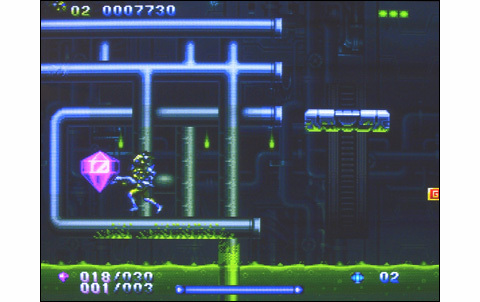 The items you can collect are varied: diamonds for the score, 1-UP, weapons, health, invincibility, extra side-flash, etc.. 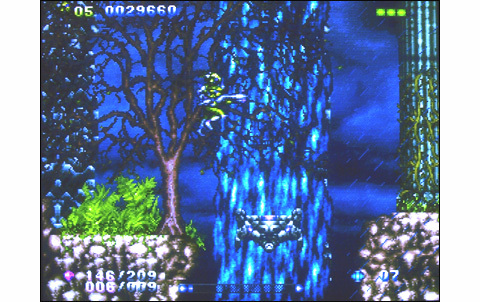 Phases of pure platform are many, plus the passages and secret rooms filled with bonuses. 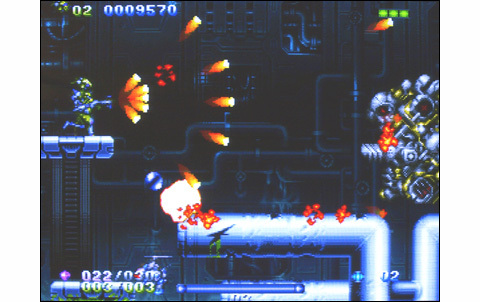 There are more intensive parts where you have to deal with dozens of enemies, the epic battles against the bosses... and let's not forget some original gameplay phases, as the second stages in the form of a Shoot them Up or the sixth one and its 'forced' scrolling, in which intuition and reflexes are paramount. 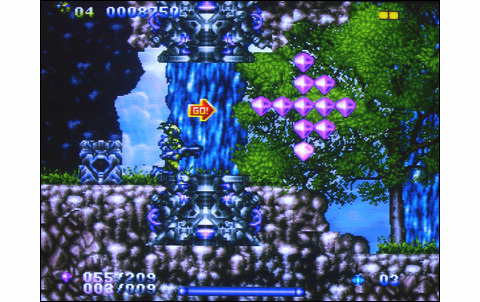 Rich and complex levels, tons of hidden places and bonuses for fans of exploration and hi-score fevers, a difficulty high enough to keep the player on their toes... this is not bad! However, on the ten stages of the soft, only the first, third and ninth can be considered as large and complex. 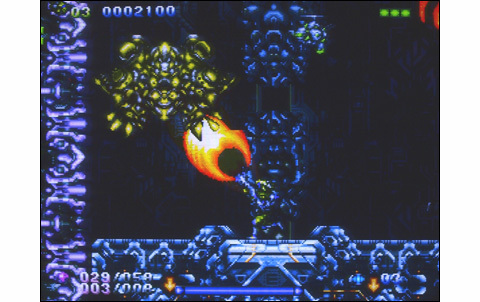 Conversely, some others are way too short: the second is cleared within two minutes, the fifth and sixth just a little more... and the tenth summarizes to the fight against the final boss. 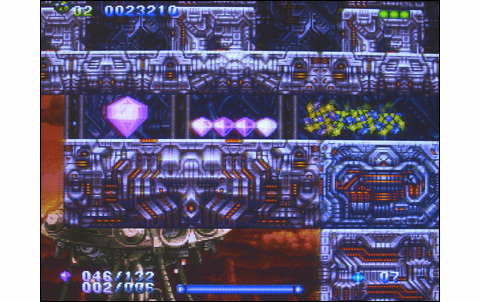 Same for the difficulty, going from very difficult phases to other ones ridiculously easy. Another criticism, the gameplay deserved to be a little more tweaked. 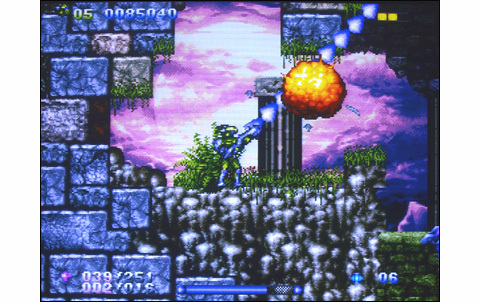 For example, the plasma shot (C) is completely overpowered, while the side-flash (D) is almost unnecessary. 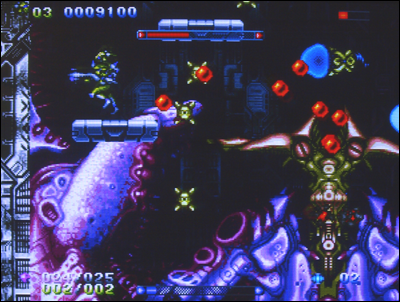 There are also the enemies out of the screen that touch you while you can't anticipate anything, flying insects coming from nowhere unpredictably charging you, or some collision tests a little approximate. 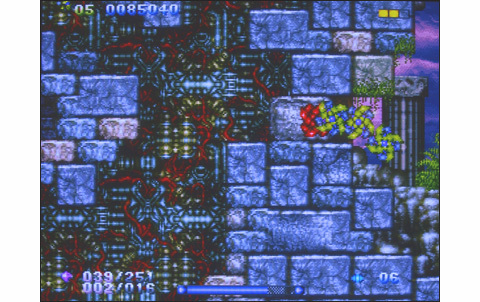 Despite these flaws, Gunlord is doing well. It's a good platform game, well realized, part of an underexploited genre on the Neo Geo. Gunlord is speedy, featuring a hero with a smooth and fluid animation, splendid differential scrollings and intense action. 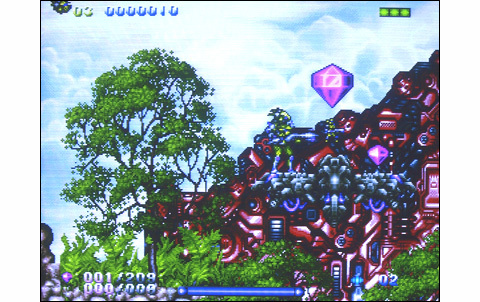 The game can be cleared within 45 minutes, but the vastness of some levels might have you coming back for more! 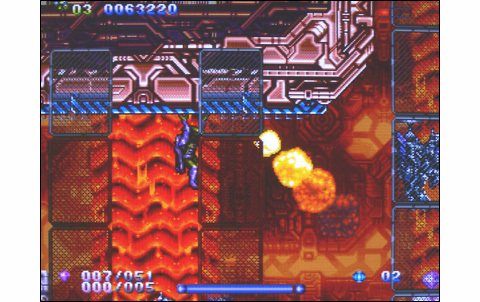 Our hero packs a large amount of moves and weapons, while being quite easy to manoeuver. Some parts of the gameplay should have been more worked to improve gaming pleasure. 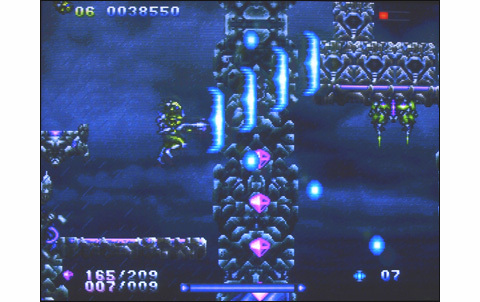 NG Dev Team signs with Gunlord a pretty good Turrican clone, well-crafted and pleasant to discover. 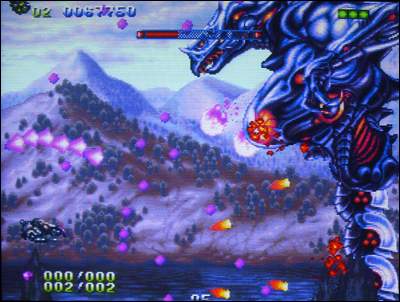 You had to spend 450/500 euros to get Gunlord when it was released. And today, shall you say? Probably a little more. Even if the game is good and the initiative to release Neo Geo games praiseworthy, such an amount of cash for this title is foolish.